One of the United Arab Emirates in the Middle East, Dubai is located to the south-east of the Persian Gulf, on the Arabian Peninsula. The landscape both in and around its glamorous, cosmopolitan city, also called Dubai, consists of sandy desert, and the weather is hot and sunny all year round. The only variations in the climate are seasonal fluctuations in the degree of heat, some differences in humidity levels at certain times of the year, and, very occasionally, rain which falls as a few heavy showers, mainly in the winter months. The most sizzling time of year in Dubai is between June and September, regarded as the summer months, when temperatures at midday hover at around 48°C (120°F), dropping somewhat a night, although with high humidity levels (around 90% on the coast in summer) conditions can still be uncomfortable. The only unpredictable element in Dubai’s weather during the summer season is the incidence of a hot, dusty north-westerly wind called the Shamal, which whips up the desert into sandstorms if an area of low pressure develops over the Emirate. There is no real autumn season as such in Dubai, but from October onwards temperatures gradually decrease until they reach their lowest points for the year between December and March. During the Dubai winter the mercury hovers between 22°C (72°F) and 30°C (86°F), and at night it can become positively chilly, particularly out in the desert where the temperature can drop as low as 5°C (41°F). The winter months are also when most of the rainfall occurs, although with an annual average rainfall of only 150mm (5.9 ins) across the whole state, this does not impact too much on holiday activities. When it does rain, it comes in the form of short, heavy showers, with statistically February and March being the wettest months. Dubai is an idyllic holiday destination all year round, with its long sunny days (up to 11 hours of sunshine a day in the mid-summer months of July and August) and predominantly rain-free climate. The height of summer, though, may be too hot for those accustomed to more temperate climates, particularly for desert excursions and beach going. The magnificent hotels, shopping malls and indoor attractions, however, are well air-conditioned, to the point that many travellers advise packing a cardigan even during the hottest season. Most visitors will find conditions more comfortable for outdoor pursuits during the winter, between December and March. Unless planning a walkabout during midday in the Old Town, most of Dubai is an indoor adventure. Modesty is important here, but it also depends on the occasion: it's acceptable to wear T-shirts, tank tops or shorts on desert safaris; upscale restaurants offer opportunities for dressing-up elegantly, but remember to cover the shoulders to and from the venue; visiting mosques requires covering the whole body for women (and head) and most of the body for men. Smart-casual and formal wear is best in Dubai, so wear well-cut jeans and a good shirt, with a light top for the mall AC. When walking around outside, shorts should be longer than knee length and all clothing should be loose fitting– light and loose long sleeved shirts or breezy trousers are great for the heat and sun. Note: January is the coolest month of the year in Dubai, but this means only that you may need a light jacket when outside at night (unless you are in the desert, when it may be good to have a warm anorak). Humidity is low and rainfall is negligible, making conditions perfect for a holiday. Events: Taking advantage of the cooler conditions, the entertaining Dubai Marathon takes place at the end of January, finishing near the towering skyscraper of Burj Khalifa. Note: February is an exceedingly pleasant month for a holiday in Dubai, with hot sunny days and cool nights, temperatures moderated by cool air drawn in from the north by a high pressure system. There is the threat of odd rain showers on a few days of the month. Events: The Dubai Desert Classic, part of the European PGA golf tour, takes place at the Emirates Golf Club in early February each year. Note: Dubai’s brief “winter” is coming to an end and temperatures creep up steadily during the month of March. Correspondingly the already minimal chance of rain lessens. There could be some fog along the coast, and humidity levels are high. Note: With the Dubai Shopping Festival in full swing during April, visitors may prefer to stay inside the shopping malls, but those who venture out will be faced with daytime temperatures in the mid- to high 30s°C (86°F) and humidity levels of up to 83%. Evenings are pleasantly cool, however, and there is no rain – any moisture present may come as mist and fog in the mornings. Note: In May Dubai swelters as rising temperature and humidity levels make it distinctly uncomfortable to be outside in daytime sun. Most visitors opt for the cool shopping malls, amusement arcades and other indoor attractions, perhaps emerging as the sun sets to enjoy the slightly lower temperatures. Note: The hot sunshine in Dubai during June results in dangerously high UV levels, so it is wise to avoid being outdoors between 10am and 3pm, and to be protected with sunscreen and a hat for the rest of the time. Temperatures in June soar, and humidity levels are at an average 85%. Note: July is high summer in Dubai, when schools close and most locals take their holidays to escape the merciless heat. Temperatures have been known to hit 50°C (120.5°F), exacerbated by high humidity. There is little relief at night. Note: Everything weather-wise is extreme in Dubai during August: phenomenally high temperatures, record humidity levels, a total absence of rain, and even the sea is like a warm bath. Watersports and parks do good business during this month, but it is wise to stay indoors during the hottest part of the day. 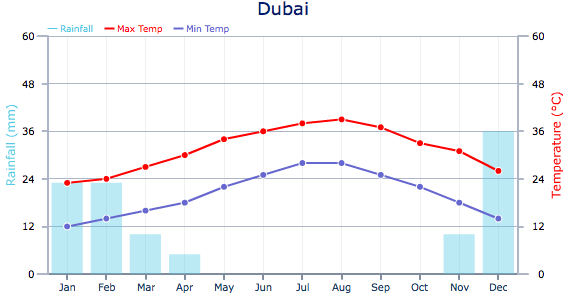 Note: Statistically temperatures begin to drop slightly in Dubai in September. It is a good time to visit if you are an early riser, because the mornings are particularly pleasant. Humidity levels are still high. Note: The heat abates sufficiently in Dubai in October to bring everyone outdoors after the searing summer, particularly in the relatively cool early mornings and late evenings, and the city fills up with visitors for exhibitions and trade shows. Events: The massive GITEX electronics trade show takes place at the start of October in Dubai, while the month ends with the Dubai International Dance Festival. Note: Dubai in November is perfect for beach and sports activities, with comfortable temperatures, plenty of sunshine and even the odd cool breeze. Events: Catch the Dubai International Motor Show and spectacular Dubai Air Show in the first half of the month. Note: December is the ideal month for taking desert safaris in Dubai, with the temperatures in the desert relatively moderate by day, though cold at night. It is also perfect beach weather, and the shops are well-stocked for the festive season. Events: The month of December in Dubai starts with a host of festivities to celebrate the United Arab Emirates National Day, on December 2. A range of entertainment, parades and performances are held across the city.